First of all I want to say that I am a around the house handy man and not a pro but I know quality when I see it and I have had a very decent amount of experience with power tools. I am guilty of owning a Craftsmen 3/8 inch, 1/3 horse power, 3 amp, corded drill "I got it because it was on sale for close to half price,I paid $20 for it. When ever I tried to use it as a screwdriver with its so called variable speed trigger,it would almost always rotate to fast which would result in it stripping the screw heads. Most times when I tried to use it for tightening nuts or drilling metal it would stall,so to make a long story short it was under powered and the variable speed control was almost uncontrollable !! Oh well you live and you learn !!! So it was time for me to get a "high quality drill". I now wanted a drill that would have plenty of power and have a "very controllable" variable control trigger and most of all I wanted this drill to be able to last me the rest of my life and I wanted it to be the best darn drill money could buy and at a reasonable price,now is that asking for to much ? So I went on the net and started reading a ton of reviews,I read up on cordless drills first but I was turned off by their overall price along with the "over priced batteries they use",and lets also remember their not the most powerful drills you can buy,they simply cannot supply you with the torque a corded drill can,and when you push a cordless drill it puts a tremendous strain on the battery and in return the same battery that might have held its charge for hours using it for light duty will now lose it's charge in a matter of minutes when you use it for heavy duty use. I have heard of some of the best batteries losing their charge within 3 minutes after using the cordless drill to do a really tough job. I still think cordless would be nice for light duty jobs as a second drill if you can afford one! 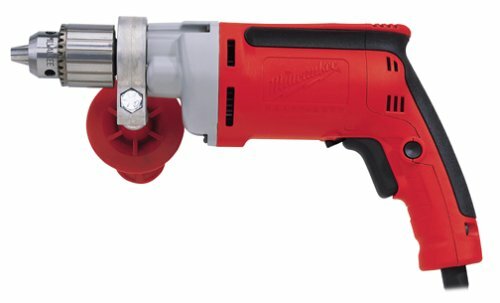 So after reading mega reviews on the net, I was still having a little trouble trying to narrow it down to one drill,but the Milwaukee 0300-20 and the "Milwaukee 0302-20 a keyless version of the 0300-20" caught my eye with it's 8 amp motor and with the claim that it has the best power-to-weight ratio in its class. All I could think was yum yum,MASSIVE POWER and TORQUE galore, and lets not forget that it's made by Milwaukee!!!! Milwaukee 0234-6 Was The Best In It's Class !!! Man I was so surprised at what he had said,and the man that I talked to was the owner of that shop, so I'm thinking to myself he must not know what he's talking about,I knew a little something about the 0234-6, I knew that it had a 5.5 amp motor and that it was a very old model, and I also knew that the 0300-20 was a much newer model with an "8 amp motor" and they cost around the same,so I'm thinking to myself "Duh" that sounds like a no brainer to me...old vs new, 5.5 amps vs 8 amps,come on, give me a break! I was also thinking to myself do the math Mr. Tool shop owner! So I got off of the phone with him and called another local tool shop and talked to the boss who's name was Mike and asked him the same set of questions and low and behold he gave me pretty much the same answer which was the 0234-6 is a much better drill then the 0300-20,then Mike went on and told me that the 0234-6 is the best drill on earth bar none !!! He said that he has had his 0234-6 for 15 years and he used it as a pro and in 15 years it never failed him once,and it never needed any repairs ! Now I'm thinking I must be in the Twilight Zone and I'm also thinking does Mike not know that the 0300-20 has 8 amps and the 0234-6 only has 5.5 amps and the 0300-20 is a much newer model. I need to also tell you that some people think the 0300-20 and the 0302-20 are just like the 0234-6 but only with more power......WRONG !!!! I even called Milwaukee tools and talked to a rep and he told me the 0300-20 was just an updated and more powerful version of the 0234-6...."I found out later that the rep Was WRONG"!!! Keyed chucks are tightened and loosened with a small hand tool, achieving a tighter and more secure lock on the drill bit than keyless chucks. They also provide greater torque for when you need extra power. On the other hand, keyless chucks require you to manually turn the chuck, making for quick and easy bit changes. * For those who may be prone to losing a key, a keyless chuck would be a sound selection ! So today I went to Lowes and had already decided in my mind that I was going to buy the more powerful 0300-20, which is supposed to be "the so called newer version of the 0234-6". When I got to Lowes, their they both where side by side the 0234-6 and the all powerful 8 amp 0300-20,but wait just a minute the 0300-20 does not have the same rock solid sturdy side handle that is screwed into the metal frame of the 0234-6, so when I held the 0300-20 in my hands and put a lot of pressure on the side handle it flexed and I said to myself "Oh No" I don't like this handle and most of all I hate the way that it is attached to the drill,it is attached by a metal band instead of being screwed into the metal frame,like they did with the 0234-6!I think the handle on the 0300-20 is attached in a very cheap,tackie and not very strong manner!!! So the side handle on the 0300-20 was almost a deal breaker for me,I could not break the handle ,but I sure did make it flex more then I think it should have! Now on the other hand I tried to make the 0234-6 side handle flex or bend, no such luck it was rock steady , and the entire 0234-6 is built like a tank and I'm not kidding. Next I tried out the trigger on the 0300-20 and the action of the trigger was not smooth at all, it was very choppy at best,let me tell you their is no way on earth for you to use a drill as a screwdriver if you don't have smooth trigger action. Plus the trigger was a short one or two finger trigger,unlike the long and Luxurious trigger on the 0234-6!!! 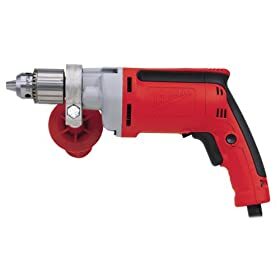 I will go one step further and say I feel that it is potentially dangerous to try and use a super powerful drill when its side handle is not very steady and when its variable speed control trigger is choppy. You cannot control the speed with a choppy trigger...so that was the deal breaker for me, a bad handle and a choppy trigger !!!! Next I tried the trigger action on the 0234-6 and it was super smooth, I was truly impressed with the 0234-6 and very disappointed with the 0300-20. At this point it was obvious to me that Milwaukee Cut Some Corners When They Made The 0300-20 and the 0302-20,and here's 3 prime examples !!!!! 3.Plus,It does not have the Removable brush cartridge,like the 0234-6 has!!!! How else do you think Milwaukee could sell an 8 amp drill for the same price of a 5.5 amp !!!! Well I chose quality over quantity so needless to say I took the 0234-6 home with me. This is a very powerful and smooth heavy-duty drill. The trigger is responsive to the touch so that you can control the speed with you finger pressure easily. I have not found anything this drill cannot do. Don't get the cheap drills. This is THE drill. I bought this drill about 6 months ago, and have been using it to mix 60 lb. bags of thin-set mortar for tile floors. I have abused this drill and it has performed every time. I really should have bought a lower rpm drill for the mortar, but already have it. I will be easing up on the abuse now, as I'm sure that I was being unreasonable to this drill and I'm not determined to break it, but I am still very impressed! 1) Ergonomics are excellent. Adjustable t-handle, probably the most solid construction of all the drills. 2) Lots of power for its size. 3) VERY HEAVY DUTY CHUCK. Not keyless, but we're talking strength here, not quick-changing screwdriver bits. 4) This is important, FIVE YEAR WARRANTY!!!!!! 5) I might be wrong, and please, if anyone else out there knows differently please say so, but I believe that Milwaukee has more domestic content than anyone else out there right now, and I'll reward quality made here in the USA. 1) Didn't come with a case. No big deal though, I'd still buy another. It's GREAT! I wish I knew about the 5 year warranty before buying some of the other tools I currently own!! I just read the review that put this piece down - at least in comparison to the Milwaukee 0234-6. I should mention that I own both pieces (as well as 5 other drills - 3 Milwaukees) and use them ALMOST inter changeably. I can't disagree with everything he listed, but honestly, taken on its own merits - the 300-20 is awesome. The balance is better, in my opinion, in the newer 300. In addition, the 300 is thinner & longer which can allow you to work closer to a stud or a wall. On the other hand, the 234 works very well in tight spots because of its stubbier size. As far as his description of the trigger speed control being choppy, well I don't see it. The 300 does not have the replaceable cord but big whoop - I wish my 234 didn't either. And his point about the cheesy handle? - well, OK, no argument. But the truth be told, I've never used it with the handle. Now that I think of it, I don't think I've used the 234 with its handle. I have the luxury of owning a big Bosch hammer drill and a RAD Milwaukee 3002 for anything real heavy. But really, we are talking about two of the best drills made. These two are powerful & heavy ½ inch drills. How delicate do you expect to be with these bad boys? Delicacy isn't what they were designed for. Both were made for banging out endless hours of 3 inch deck screws or for boring a 2 inch hole through triple headers. All said & done, I prefer to use the 234 for screwing sub-flooring & plywood or simply with smaller screws. Working with decking & 2xs (3 & 4 inch screws) I like the feel of the 300 - it just feels better in my hand - not for any want of power on the 234's part. Both are life time drills as far as I'm concerned; both pieces will probably end up being used by my grand kids. Buy quality - buy Milwaukee. I have waited to buy a strong corded drill. This product came up that is shipped and sold by Amazon, so it was shipped for free. And it was on sale at the time. It is as expected from Milwaukee, although it used to be made in America. Now it is assembled in Mexico from American made parts. If I had known this drill wasn't a variable speed model I would never have bought it. It's very hard to use any drill with only one speed.